Buying a mattress for a child is a significant investment. After all it's a decision that affects your sleep as much as theirs, and it's important to get it right for small, growing bodies. 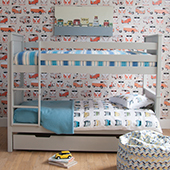 We’ve teamed up with experienced, UK based mattress makers to develop a small range of mattresses specially for children and to compliment the superior quality of beds we offer. All the terminology is bewildering, but we think there are a few simple references. To start with we believe the most comfortable and heathy sleep position is with a reasonably straight spine. 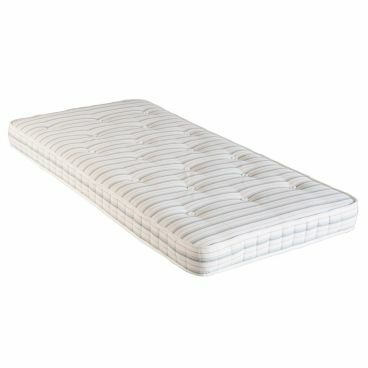 Therefore the mattress needs to be supportive – which is a better way of thinking about it than how “firm” it is. A supportive mattress is a responsive mattress, that can adapt to all the curvy parts of the body, offer support and rebound (go back to the original shape) when the body moves. There are a couple of other things to consider. Firstly that children tend to move around in their sleep more than adults. Therefore the mattress needs to be more responsive and rebound back into shape. Also their shape is constantly changing as they grow and a more supportive mattress will be able to respond to these changes and providing greater comfort. For this reason we do not offer cheap foam mattresses because they are less responsive and supportive. 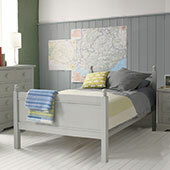 Instead we specify traditional spring units used in better quality adult mattresses. “Open Coil” spring mattress – individual springs arranged to stand straight and linked together to create a single layer about the same size as the mattress. The springs are made from high tensile steel which means they are very responsive and will rebound to their original shape for a very long time. 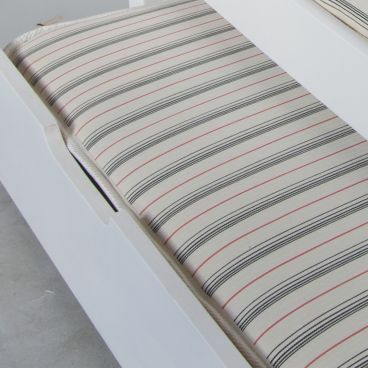 The spring “bed” is bound with an outer or border rod to give the mattress a firm edge and helps retain its shape. This is the most common construction of a good quality mattress. “Pocket” spring mattress – springs are individually sewn into fabric “pockets” and then sewn together side by side to create the inner core. The pocket springs are smaller than conventional high tensile springs in an open coil core and there are more of them. They can move independently of one another and there are more of them allowing the mattress to contour more precisely to your child's shape and weight. Finally a good quality cover – and where we specify 100% hard wearing cotton and which is also breathable. Hand tufting - a traditional technique when the comfort layers stacked on top of the mattress are held in place by a pattern of tufts, which are attached to the inner core. 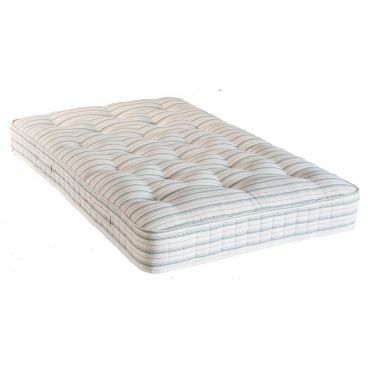 It gives a quilted look and indicates a superior comfort level as the fillings cannot move around. 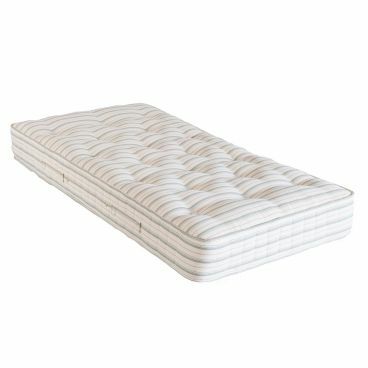 Sewn Side Fluting – again a way of helping the mattress keep its shape and where the edge border cover and filling is sewn together up and down to stop the fillings moving and to keep the spring units in their proper place. There is another and very specific piece of information and requirement. 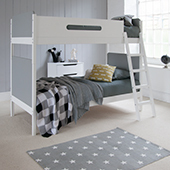 Raised beds and Bunk beds often require a mattress with a maximum depth of 15cm so that there is enough space between the top of the mattress and the top of the guard rails around the top bed. We have used the same quality of spring units etc to produce options of the same specification of mattresses but at a 15cm thickness. 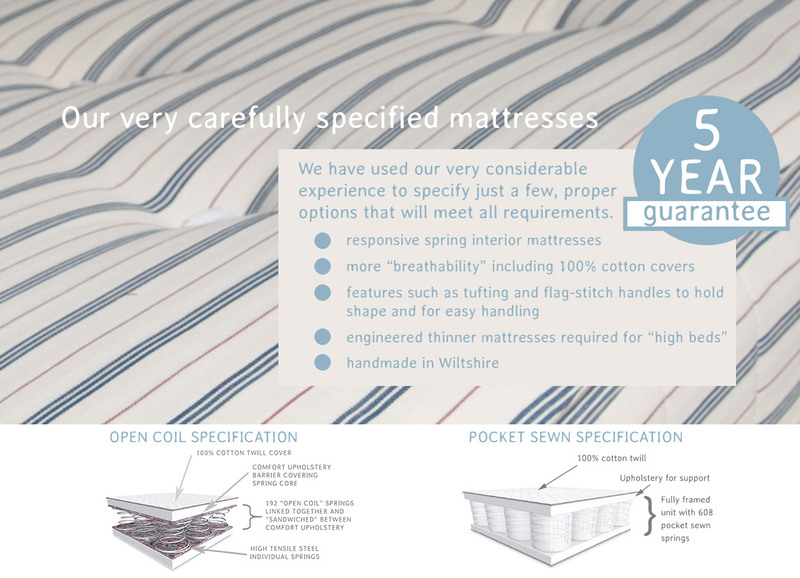 Our “open coil” specification has a relatively high count of 192 high tensile springs in a full size single mattress. 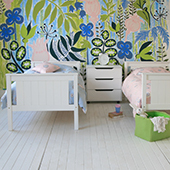 This is the most common construction and absolutely suitable for children’s beds. Our “pocket spring” specification also has a relatively high count of 608 individually sewn springs. This is said to be more responsive and supportive. All our mattresses - including the sofa bed and trundle mattresses – are hand tufted and with sewn “fluted” sides to maintain shape and comfort.